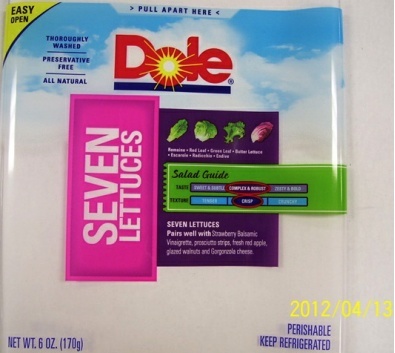 Dole Fresh Vegetables is voluntarily recalling 756 cases of DOLE® Seven Lettuces Salad for possible Salmonella contamination. No illnesses have been reported in connection with the consumption of this product. A sample of the product tested positive for Salmonella in a test conducted by New York State. No other Dole salads are included in this recall. For questions, call the Dole Food Company Consumer Response Center at 1-800-356-3111 Monday through Friday from 8:00 am to 3:00 pm PST.